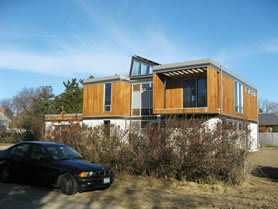 Wieler's Rapson Greenbelt Houses were originally designed by Ralph Rapson, the influential Modernist architect. His design of Case Study House #4 was called the "Greenbelt House" due to a unique glass atrium which divided the home into public and private spaces. The Greenbelt House was, and continues to be, an influential model for architects around the world. The Greenbelt Houses, through a partnership with Ralph Rapson & Associates, are available to homebuyers across the United States, exclusively from Wieler. 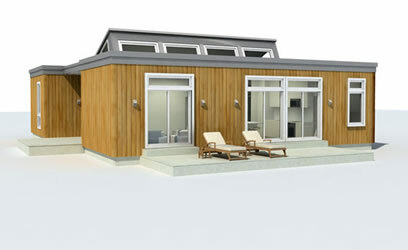 The Greenbelt 1 is a 3-bedroom house with 1,560 ft2 of interior space. The Greenbelt has been designed to fit into a variety of lifestyle needs. First-time homebuyers may be interested in the Starter, which can also serve as a detached office or guest house. 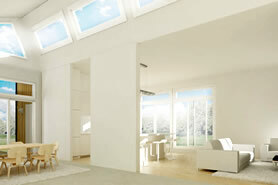 Larger families will find the Greenbelt 2, with its 5 bedrooms, to be suitable for their needs. Greenbelt floor plans range from 576 to 2,660 square feet, and also include townhouse designs. Browse our selection of Greenbelt designs to pick out the home that's just right for you or contact Wieler to customize a Greenbelt House to meet your needs. Wood floors, with carpet in the bedrooms and tile in the kitchen and bathrooms. Other options are available.